Chicago: The S. J. Clarke Publishing Co.
CALDWELL, CHARLES (deceased), was a native of Mt. Savage, Md., where he was born July 10, 1836. 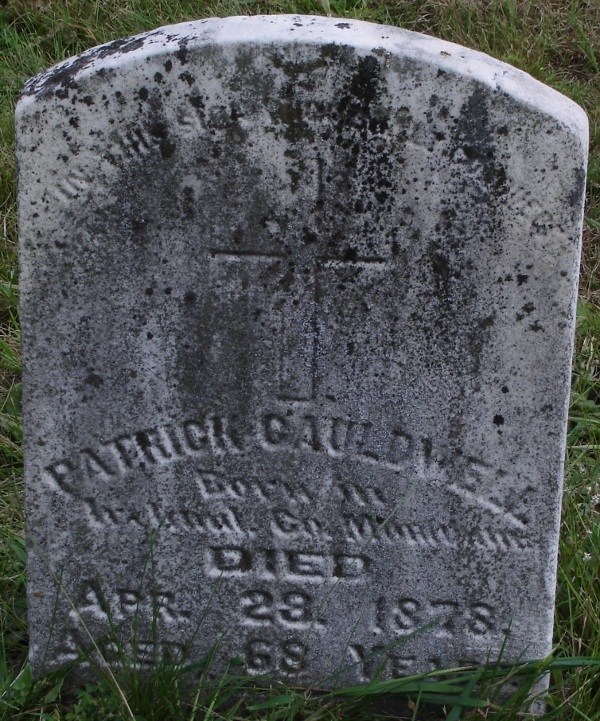 His parents, Patrick and Mary (Reynolds) Caldwell, were natives of Ireland, who emigrated to the United States in early youth and located in the state of Maryland, where they later were joined in wedlock. Shortly afterward they moved to Cass County, Ill., and entered a tract of government land three miles east of Shiloh, where both spent the remainder of their lives. Charles Caldwell went to the neighborhood district schools in boyhood and continued to make his home with his father and mother until the time of his marriage, December 10, 1860. On this date he took for his wife Catherine Heaton, who was born October 18, 1844, in Manchester, England, a daughter of John and Mary Jane (Fullerton) Heaton. John Heaton was born at Wiggin, England, January 1, 1810, and was a soldier in the British army. The mother of Mrs. Caldwell was born in the Tower of London, England, a daughter of Gen. Joseph and Martha (Glenn) Fullerton. He was a general in the British army and was given a farm and pension for life in Canada. In 1850 the Heaton family located on a farm ten miles east of Beardstown, Ill., moving later to the town of Virginia, where the father passed away June 22, 1900, the mother having preceded him to the grave November 30, 1896. Their children were as follows: Noble, of Alberta, Canada; Edward, James, Mary J. (Mrs. Ben Williams), all deceased; William, of Spangle, Wash.; Charles, who died in Washington in 1913; Alice (Mrs. Ed. Savage); Susan (Mrs. Reuben Lancaster), of Virginia, Ill.; Martha (Mrs. R. H. Payne), of Kansas City, Mo. ; Thomas, of Jacksonville, Ill.; and Catherine. Charles Caldwell, after receiving training in the country schools, was reared under Catholic influences and adhered to that faith, while his wife became a member of the Presbyterian church. In political matters, Mr. Caldwell acted with the Democratic party, although not a seeker for public office. He was an upright and industrious man, a prosperous farmer, and a worthy and much respected member of the community. His useful life came to an end October 25, 1878. After her husband's decease, Mrs. Caldwell remained on the home farm and personally superintended it for twenty-five years. At the end of that period she moved to Cass Siding, Ill., and in 1902 purchased the property in Virginia, Ill., where she has since resided. Mr. Caldwell and his wife had the following children: Patrick H., deceased; John, who lives in Cass County, Ill.; Emma C. (Mrs. Duncan Reed), of Bluff Springs, Ill.; Mary Jane (Mrs. James Mead), of Virginia, Ill.; Elizabeth (Mrs. Homer Coleman), of Sangamon Bottom, Cass County, Ill.; Catherine (Mrs. John Hurzburger), of Cass County; and Charles E., who is on the home farm. Mrs. Caldwell is a lady of high character and most estimable qualities, and commands the respect of a wide circle of acquaintance. She is a member of the W. C. T. U., of which body she has officiated as county president for a number of years. She belongs to the Eastern Star, of which fraternal body at Virginia she was elected warden in 1910.